Ceci est mon tout premier billet. Pour avoir accès à mes plus récents billets, prière de suivre ce lien vers ma page d'accueil. 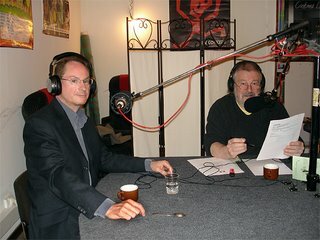 J'ai été l'invité de Peter Hackett (traducteur, producteur, professeur), en début d'année 2007, dans une de ses deux émissions hebdomadaires en anglais sur Radio Périgueux 103. Nous y avons parlé de la conception de sites Web. Je n'y étais pas vraiment préparé et et j'ai fait ce que j'ai pu pour ne pas passer pour un total ignare. Avec le recul, je m'aperçois qu'il s'agissait là d'une très bonne expérience. When Martin Swanson (AngloInfo Aquitaine) called and asked me if I wanted to be on a radio show he sponsors, my initial reaction was: no way… But then I realised this was an opportunity I couldn’t miss, and promptly called him back to say that I would go. Never mind if after all, I was going to make a fool of myself (this is what CBT* taught me anyway). On the morning of 15th March, I got a warm welcome from an affable man, about my height, with glasses and a silver beard : Peter Hackett. Peter made me feel immediately comfortable, but the sight of this round table with a set of huge black clothed microphones, reminded me in no uncertain way what I had come here for : Talking live and for the first time on the radio. For someone like me, who has an ambivalent attitude towards humility (or is it just timidity) and a latent desire to be in the limelight, it was a weird moment. Should I be ‘zen’ and make it look like I had been born with a microphone stuck to my lips, and an oversized headphone ill-fitted on my elongated skull? Should I just pretend I am suddenly victim of the bird flue or of some other terrifying afflictions and run for the door? I choose none of the above and stayed there, somewhat tetanised, crossing my fingers, praying a god I don’t often believe in, trying to breathe deeply with lungs that obstinately stayed constricted. Bravely, I listened to Peter Hackett, presenting his show and his ‘very special guess’ (his own words). That last sentence didn’t do a lot to make me feel better. I thought I would have to talk straight away after Peter’s introduction, but Mick Jagger made his vocal cords heard, and that gave me some needed respite; Just enough to get my lungs in some sort of working order, carrying some very much needed air to my brain cells. Whilst Jagger was singing, Peter briefly explained to me what I would be asked. What was Web design about. Web design is something I do almost everyday and for over 10 years, so it shouldn’t be difficult to come up with a good answer. Yet the answer eluded me. I don't recall having been asked such a general question about Web design, and as my mind went blank, I couldn’t remember what I had put on my own Web page about the subject… D'oh! I did what I could in the circumstances, and let's hope I didn't pass for a complete moron. One learns, and what I learnt was that one should always know in advance what the main subjects of the discussion are going to be. My fault, I should have called Peter before hand. Peter Hackett is a true professional. Presenting a radio show is not his main job, but one can tell he knows the radio business very well. He worked in perfect harmony with Hervé the disc jockey and sound man at Radio Périgueux 103 (assisted by Fabrice). I learnt that when Peter points two fingers at me (the index and the major opening and closing like a pair of scissors), he is not being rude… He is just telling me to finish my sentence so he can ask the next question or bring on a new subject. I also learnt to watch the small red light on the wall, so I know when I can talk freely or when we are live and therefore, watch my mouth. I may eventually upload the interview, if I can get passed the embarrassement I feel when I listen to it... Just send me a comment if you want me to let you know when it's online. This first interview was a great experience, there is no doubt about it. Despite the stress it caused, I have no regrets and hope to be given another similar opportunity soon. So thank you Martin for your call, and as I said at the end of the show, "Thanks for having me Peter".